We knew since the moment we started in real estate that by developing new marketing strategies we would achieve excellent results for our clients. Less than 1% of agents in Nevada go to the lengths that we do in marketing our clients’ homes, which explains why only 1% of real estate agents in the entire state get the kind of results that we do. Traditional real estate agents use a “passive” approach to selling and marketing, which simply means they wait for the buyers to come to them. These old school methods don’t hold a candle to the “active” marketing and selling system that we do 7 days a week to promote your home in today’s real estate market. We take the time to contact buyers and their agents and convince them to view your home. Our pro-active marketing plan includes 151 steps that are geared toward one purpose – getting your home sold! 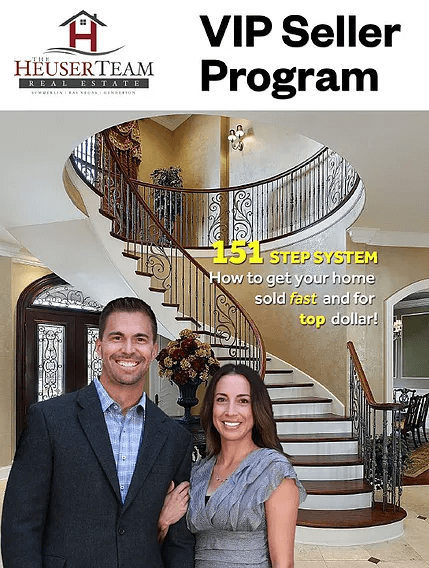 The Heuser Team is so confident in our 151 Step Marketing Plan that we offer unprecedented guarantees to our clients, such as the exclusive Guaranteed Sold Program. With this program, if we don’t sell your home within 60 days at the price and terms we agree on in writing, we’ll sell it without making any commission at all. There is also the No Hassle Listing GUARANTEE, which is our 100% satisfaction guarantee for sellers. If you don’t like what we are doing to sell your home then you can cancel at any time. To review the complete 151 Step System, please click the image to the right. For buyers interested in buying your property, we have our Love it or Leave it Guarantee, which tells the new buyer we will sell it for FREE for them if they don’t love it within the first year. We know we can sell your home, you just have to contact us as your first step to getting the process started. Complete the seller information form or call us at 702-748-8100. Take the time to review our Maximum Payoff Guide for Sellers to learn more about how we achieve excellent results for our sellers.